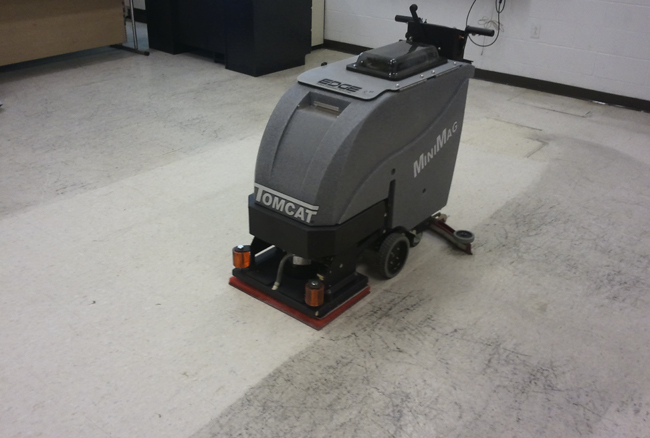 Unlike ordinary floor scrubbers, our Tomcat EDGE® scrubber products are all rectangular shaped allowing for full access to tight corners. As Close As You Will Get! 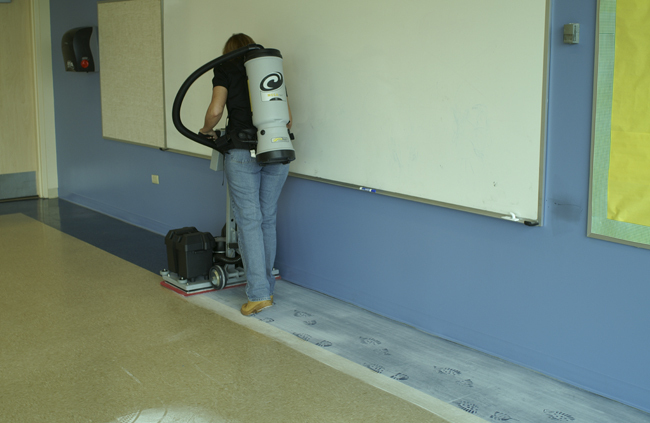 Tomcat EDGE® Orbital Floor Scrubbers are the closest you are going to get with a floor scrubber to the wall. The bit of pad overhang is specifically there so it won't damage your wall and acts as a buffer. 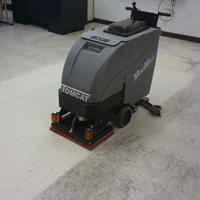 Tomcat EDGE® Floor Scrubbers can strip floor finishes off without using any Chemicals. 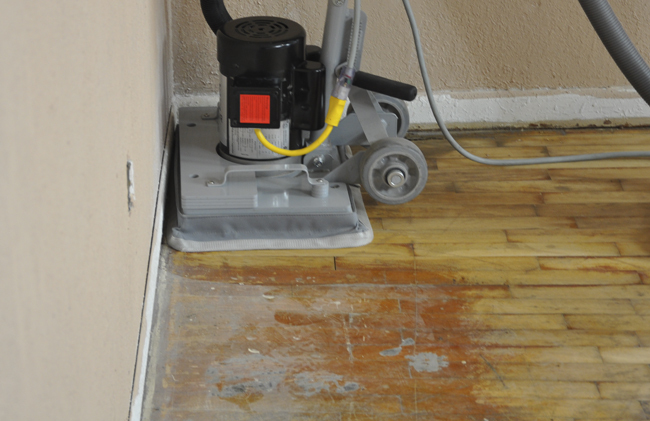 The most green product you can get for floor restoration! 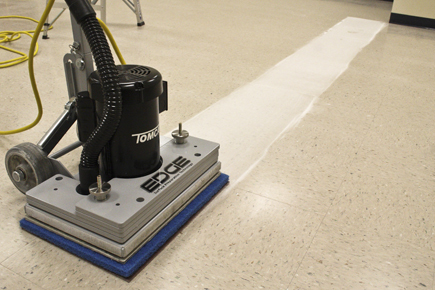 If you have a large amount of floor with paint or mastic, Tomcat EDGE® Abrader Plates are what you need! Just see what one pass with the Abrader Plate will do to the floor. * Click on the above images to enlarge and view them all as full gallery. 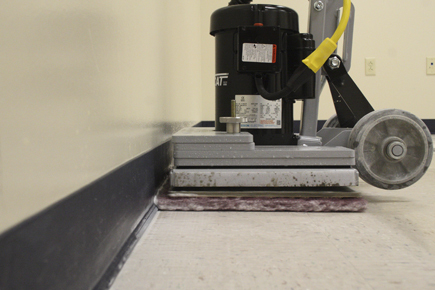 As you can see, because of Tomcat EDGE® Floor Machine's rectangular design, the square corners allow these products to get into tight corners and against baseboards that normally were impossible. 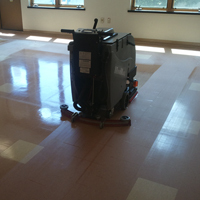 Chemical Free Floor Stripping - Plus 70% less Water Usage! 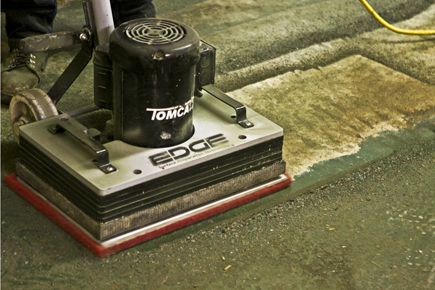 The Tomcat EDGE® Series can work with a variety of quality pads, eliminating up to 95% of the chemical stripping required. All models are easy to use and maintain. New operators can be trained in a matter of minutes, unlike the "expertise" that is often learned the hard way with traditional rotary machines. Get better and more consistent results, and eliminate those large swirl marks. 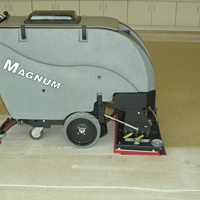 Uniquely designed to prepare VCT floors to be re-finished without the use of harsh chemicals. Recommended to use with our "Shine Restorer". This pad will efficiently take off black scuffs and restore a high gloss. 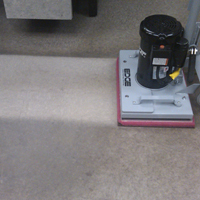 Designed for daily maintenance scrubbing with chemicals. 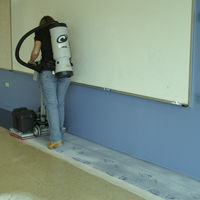 It removes dirt and heal marks from high traffic locations. Designed for use with chemicals and extreme stripping needs. 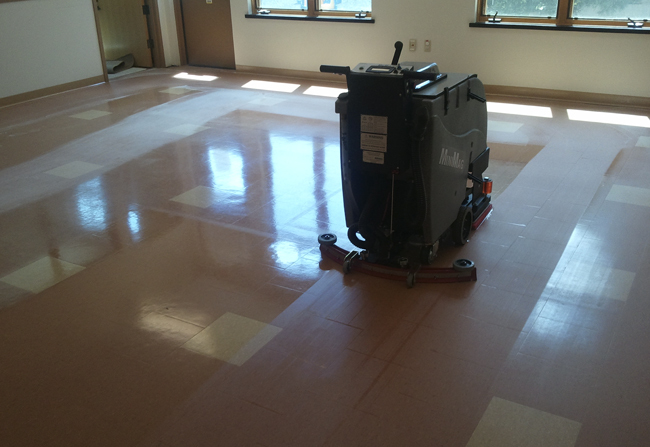 Chemicals required, and used to cleaned grouted tile, terrazzo, poured non-slip floors and other uneven floors that typically require a brush. 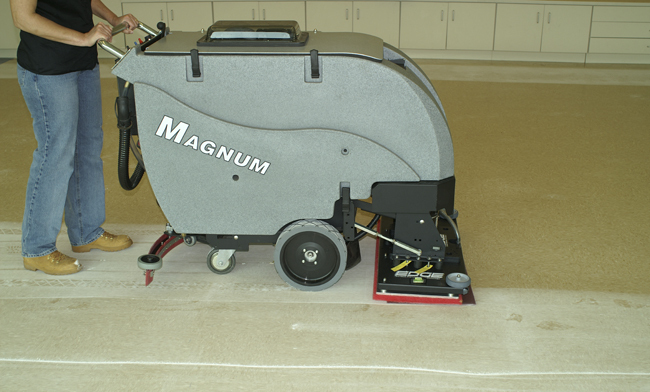 Screen Sizes: 13" x 19" or 14" x 20"
For removal or repair of coatings on wood floor surfaces. An ideal application would be refinishing gym floors. Both sides of the screen can be used, and dry or wet is allowed. 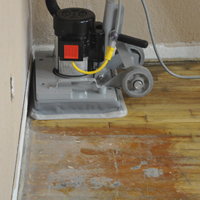 For removal or repair of coatings on wood floor surfaces. An ideal application would be refinishing gym floors. Both sides of the screens can be used, and dry or wet is allowed. 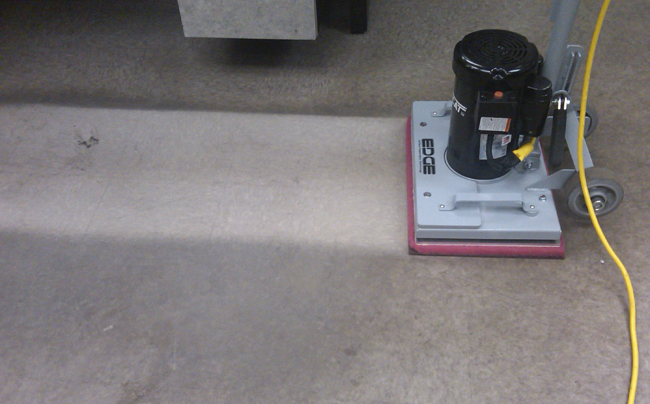 This pad is placed between the Tomcat EDGE® machine's gripping plate and the Scrubbing Pad. Special Pads with Microscopic diamond materials which clean and polish the floor mechanically as a substitute to harsh chemicals. Made from a natural blend and fibers used with conventional stone polish chemicals. 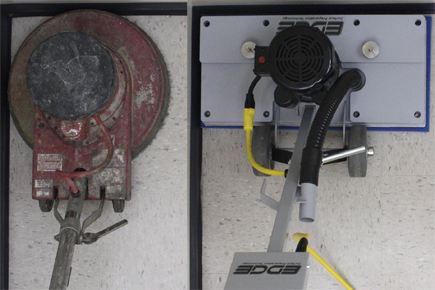 A steel abrader tool that is covered with carbide chips, and designed to remove glue and paint on concrete without the need for harsh chemicals.